Click purple price link above to checkout securely using credit card or PayPal account. US shipping is included in above price. To add a chain/cord or to buy multiple items contact me to arrange purchase. More about the design, project, and symbolism on my blog. Crosses are now in current inventory and available for quick shipping. This cross was designed for St. John Lutheran Church, Cypress TX with my 3 dimensional interpretation of their stylized eagle logo. Available to all for purchase. 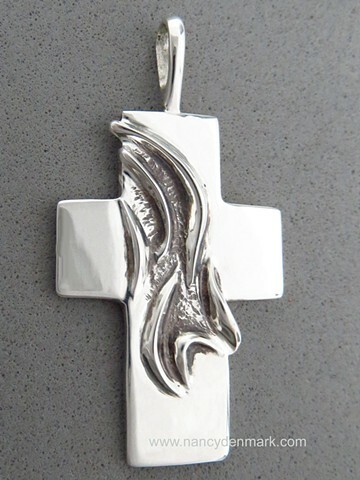 High polished silver cross with a raised stylized eagle design. (measurement is approximate and does not include bale).